Stogie Commentary: More Industry Consolidation Coming? Rarely does a month go by without some whisperings of an imminent major cigar industry deal. And to be fair, between manufacturers, distributors, and retailers, there are plenty of prime targets for consolidation in the cigar industry. There are also plenty of reasons for such consolidation. Larger companies can better adjust to the new tax and regulatory burdens that cigars now face. Combining sales forces and distribution channels can lower costs, keeping prices down for consumers while keeping profit margins healthy. Increased buying power also ensures access to the best tobacco available, as well as bigger advertising budgets to get the word out about new products. But besides the business reasons, there’s another reason why I think I hear these rumors with such regularity: It’s fun to speculate—some might call it gossip—about such things. After all, in the past year I’ve heard rumors that Rocky Patel has fielded offers from both General Cigar and Davidoff. But that’s the old rumor, so let me get on to the newest. A Deal Going Down in Miami? One such rumor involves La Aurora, distributor Miami Cigar & Co., and Don Pepin Garcia. I first took notice of the speculation when Gary Korb of Famous Smoke Shop, and chief writer of CigarAdvisor.com, posted a highly suggestive article linking Rene Castañeda, vice president of Miami Cigar & Company, with Don José Pepin and Jamie Garcia and Guillermo León and José Blanco of La Aurora. 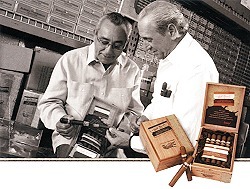 According to Korb, the group was spotted meeting in the Dominican Republic, leading Korb to speculate about “some sort of distribution pact or, even more significantly, the acquisition of Pepin’s company by La Aurora.” Then, in a follow-up post, Korb reported that Guillermo León (of León Jimenes cigars and La Aurora) was making his first trip to Nicaragua reportedly to visit the Garcias at their Tabacalera Cubana (TACUBA) factory. Neither of those reports meant much to me, until a source told me that they had just spotted a similar group (including Nestor Miranda, Rene Castañeda, and José Blanco) at Garcia’s El Rey de los Habanos factory in Little Havana, Miami, accompanied by Pepin and his daughter, Janny Garcia. Could they be finalizing some deal started in the Dominican or Nicaragua? Such a deal wouldn’t be shocking. The pieces already seem in place: Garcia already makes cigars for Nestor Miranda (pictured above with Pepin Garcia), head of Miami Cigar & Co., as well as 601 and Cubao for EO Cigars, which is distributed by the same outfit. Meanwhile, Miami is already the distributor for La Aurora. Of course, it could all mean nothing. But then again it could be the makings of a major deal. Either way, the speculation is fun and we’ll be making some inquiries to see what else, if anything, we can find out. Naturally, if we learn anything juicy, we’ll report it exclusively here at StogieGuys.com. Rocky Patel and Davidoff? haven't heard that one before. I'm assuming that was before DAvidoff bought Camacho. Don Pepin's operation being bought would be big news. I just hope any sale doesn't effect the cigars he makes (both under his name and for others). They're fantastic as is. I wonder what Ashton or Tatuaje (two companies he maes cigars for) would think of such a sale? He already dropped Padilla, could they be next? I had heard that the RP 1961 was a DPG blend, but I haven't seen confirmation of that rumor yet. The special deal at the event was for those who bought at least 5 sticks: one of DPG's top rollers was there putting wrappers on a special cigar–the filler/binder from the Blue Label with the wrapper from the original My Father. I got two; smoked one at the event and it was great. The word was going around that this will be the basis for some future item in their lineup. Rocky & Pepin would be awesome. I'd pay big bucks for that cigar. Nice! Born and raised in MIA myself Big Mike! The 1961 comes from a new factory that Rocky purchased in Nicaragua. It is not a DPG made smoke. As for all of the Pepin’s and Nestor in Nicaragua together, it might have been for the grand opening party of DPGs new digs.